[Episcopal News Service – Honolulu] The Asian diaspora isn’t easily defined; “Asia” can mean anything from Chinese to South Korean to Filipino to Indian. Each ethnicity has its own rich cultural identity, with many having diverse dialects and cultures within that identity. As evidenced by the opening Eucharist of the Sept. 27-Oct. 1 Episcopal Asiamerica Ministries National Consultation, many of those cultures and identities are present in the Episcopal and Anglican Churches. 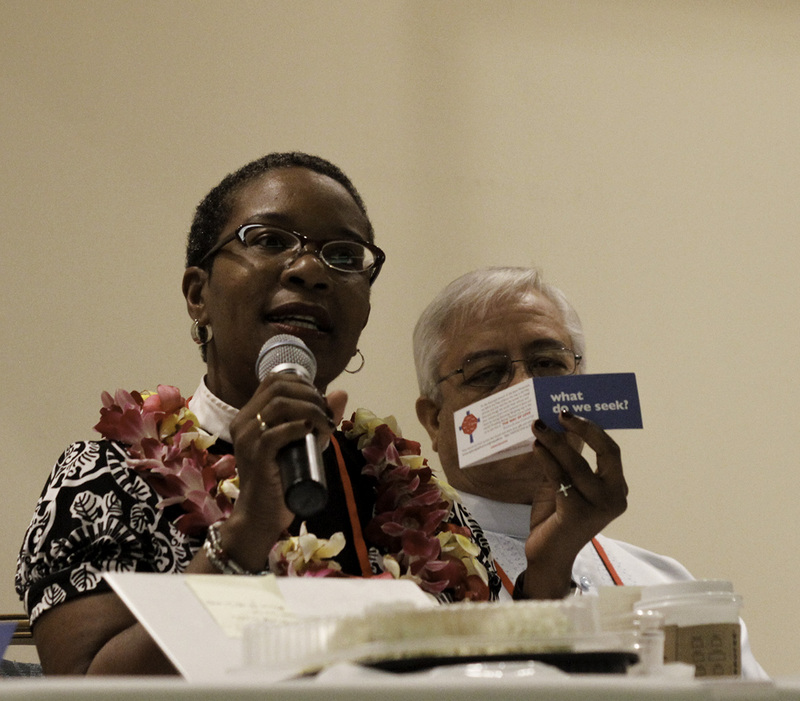 “There are almost 300 people coming here from various Asian constituencies, not only in the United States, but we have representatives from Vancouver [British Columbia] who are inspired by the work of Episcopal Asiamerica Ministries,” said the Rev. 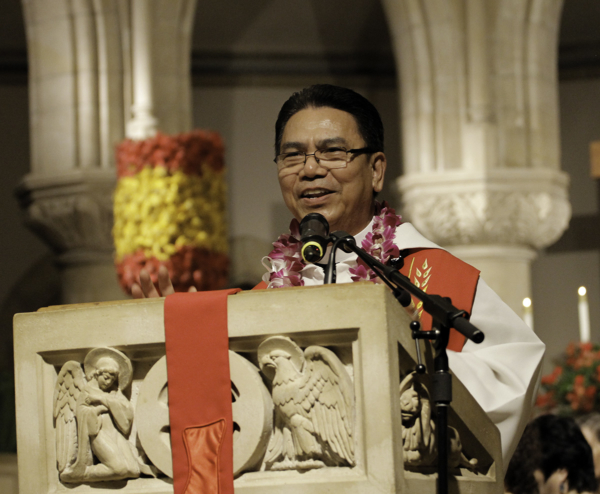 Winfred Vergara, the Episcopal Church’s Asiamerica missioner and the consultation’s co-dean. “We have formed an ACAM, Anglican Canadian Asian Ministries, and there’s a representative from the Church of England and they want also to have a similar organization like we do in England. So, I’m really hopeful and excited about this. Registration topped 267 participants representing Asians from the United States, Canada, England, South Korea and the Philippines. During opening Eucharist, the Prayers of the People were offered in nine languages – Chinese, Filipino, Japanese, Korean, Indian, Karen, Tongan, Hmong and English – a representation of the diverse ethnicities present. 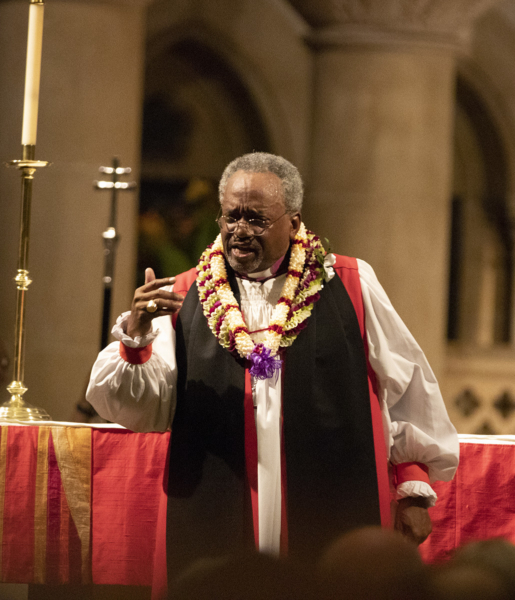 Presiding Bishop Michael Curry preached to a packed crowd during the consultation’s opening Eucharist held Sept. 27 here at the Cathedral Church of St. Andrew. The Rt. Rev. Allen K. Shin, bishop suffragan in the Diocese of New York, presided. The offering went to the Philippine Episcopal Church’s response to aid those impacted by Typhoon Mangkhut, a massive storm that brought torrential rain and 165 mph winds to the island of Luzon on Sept. 15, 2018, killing upwards of 100 people and displacing hundreds of thousands of people from their homes. “I really do believe that what you are doing, that this ministry … gathering the Asian-American community wherever you may be, gathering together as part of the Episcopal-Anglican way of being Christian – that this gathering together has more significance than just coming to a church meeting,” said the presiding bishop during his sermon at the opening Eucharist. “Plenty good room for all God’s children. Real evangelism is about changing this world from the nightmare it often is into the dream that God intended from the time God first said let there be anything at all,” Curry said. Curry referenced June’s royal wedding, where he preached about Jesus’ love for the world, and how the love of two people brought together an audience of 2 billion people to witness that love. During the service, the ANDREWS program and its first group of mentors were introduced. ANDREWS, an acronym for Asiamerica Network of Disciples, Revivalists, Evangelists, Witnesses and Servant Leaders, is a mentoring program of the Asiamerica Ministries Office in partnership with Episcopal Asiamerica Ministry Council and the Thriving in Ministry project of Virginia Theological Seminary. ANDREWS’ goal is to develop a network of well-trained mentors and disciple-makers from among the EAM ethnic convocations – Chinese, Japanese, Korean, Filipino, South Asian, Southeast Asian and Pacific Islander. “Rice and Sing,” an anthology of diverse, Asian-cultural hymns and spiritual songs; in-person training; and a virtual classroom are in development. “We have big plans for the mentoring program. 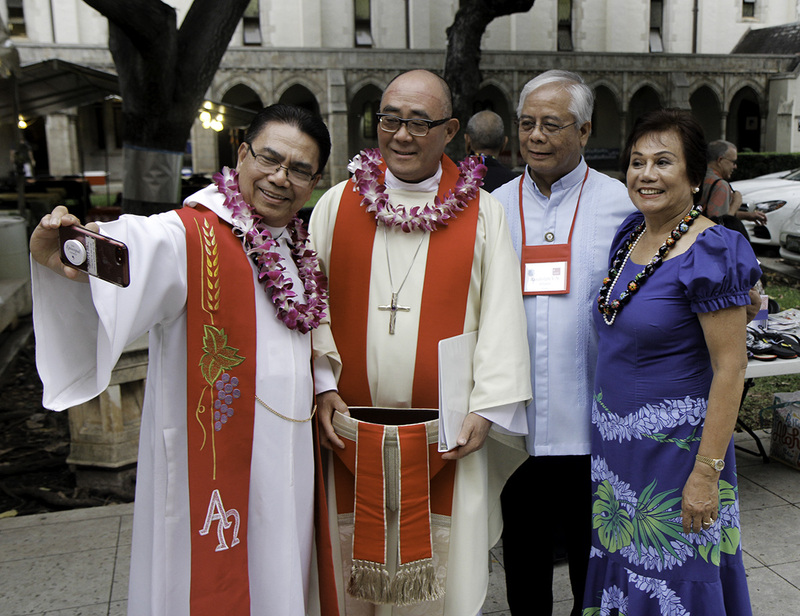 We want to develop 70 well-trained Asian-American Episcopalians to do evangelism, church planting,” and revival of churches, said Vergara – topics that were explored through the lens of the Jesus Movement and the Way of Love on Sept. 28 during the opening plenary session. The Rev. Stephanie Spellers, canon to the presiding bishop for evangelism, reconciliation and stewardship of creation, talked about her own journey to reclaiming Christianity, a path that took her into Eastern religious philosophy before she returned to Christianity and reclaimed Jesus, something the Episcopal Church is now doing, she said. Then, she ended up studying in the religious department at Wake Forest University in North Carolina, a Southern Baptist school. Her studies started her on a different spiritual path, one focused on practice and a way of being and living. Eventually, after going deeper into Eastern traditions, she came back to Christianity, when a Buddhist nun in San Francisco told her to reclaim Christianity. “It feels like that’s what we are doing as an Episcopal Church right now,” Spellers said. “We are reclaiming Christianity not as only a rigid belief system, a set of doctrines and dos and don’ts; we are certainly reclaiming Christianity as a community that raises all the people, not just some of the people, but I think what we are doing especially today is we’re reclaiming the way of being Christian as being a follower of Jesus in a way, on a path. And that’s the understanding … I have of what is the Jesus Movement. The consultation includes two days of workshops, which are livestreamed and can be viewed on demand here. Workshop topics include Issues in Hawai’ian Sovereignty, Identity and Reconciliation, Living into a Healed Community Through Hawai’ian Dance, Anti-Human Trafficking (Mission to End Modern Day Slavery), Evangelism in the New Community, and Toward Peace in Community. The two additional plenary sessions topics are Becoming Beloved Community and Caring for the Earth and All Creation. The consultation continues through Oct. 1, when Vergara will preach at the closing Eucharist. – Lynette Wilson is a reporter and managing editor of the Episcopal News Service.